Some may feel that New Yorker Ibrahim King, 36, got what he deserved after he thought it would be “funny” to punch a totally unsuspected 21-year-old girl in the face in an apparent bout of the loathsome “knockout game.” After he punched the girl without warning he was chased down, slammed around, had his dreadlock pulled out of his scalp and forced to apologize by a bystander. 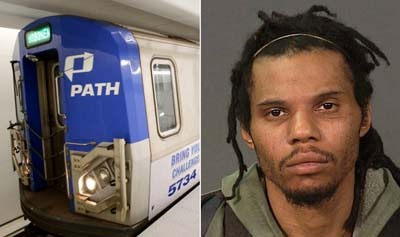 Ibrahim King, 36, allegedly slugged 21-year-old Elizabeth Mejia, breaking her orbital bone, in the Ninth Street station around 3:40 a.m. Sunday. “He looks at her for a very short moment and then he pulls his right fist back and lunges across the railing and punches her in the face,” said Mejia’s friend Steve Sala. Sala chased and grabbed King, then put him in a chokehold, ripping out one of his dreadlocks in the process. The girl’s nose and orbital bone were fractured by the assault. This disgusting crime has one thing in common: They are nearly universally perpetrated by blacks against whites. Yes there have been a very few stories of whites being the perp, but those stories are about one percent of the total.